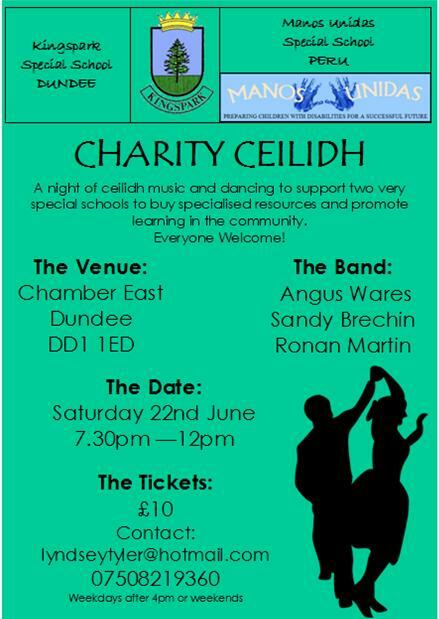 Come and join us for a night of music and dancing to support two very special schools with the fabulous combination of Angus Wares, Sandy Brechin and Sandy Mathers at The Friary, Tullideph Road, Dundee, DD2 2PN on 22nd March 2014. (BYOB). The pupils at both Kingspark Special School, Dundee and Manos Unidas Special School, Peru experience a range of challenges, including profound and multiple learning difficulties, behavioural challenges and Autism Spectrum Disorder. By coming to this event you will be supporting both schools to provide specialised resources and promote community learning. Manos Unidas School will also use the money donated to help run the school, pay their teachers and promote community awareness. Tickets are £10 and you can contact me at lyndseytyler@hotmail.com. Everyone Welcome! Two teachers from Kingspark School (Dundee) are travelling to Cuzco, Peru to visit Manos Unidas Special School in July. Hoping to take out any easily packable resources and toys or any specialised equipment/resources for pupils with additional needs. Also looking for raffle prizes or vouchers for the ceilidh, see poster, email lyndseytyler@hotmail.com for tickets.